Shostakovich's Second and Eleventh Symphonies are both inspired by Russian revolutions. The Eleventh Symphony, "The Year 1905", marks the bloody revolution of its namesake year. It is an astonishingly atmospheric symphony, of cinematic breadth, especially the second movement which depicts the Bloody Sunday massacre in St Petersburg. Symphony No 2 was written to commemorate the 10th anniversary of the October Revolution. Though it is a much shorter work than the Eleventh, clocking in at less than 20 minutes, it is by no means any less dramatic. Although dismissed as an experiment by the composer later in his career, it remains an important step in the development of one of history's greatest symphonists. 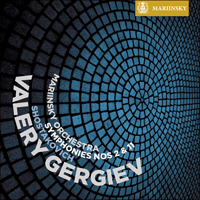 Here Valery Gergiev, along with the Mariinsky Orchestra and Chorus, delivers definitive performances of both works. Shostakovich wrote his Eleventh Symphony in 1957. Politically, this was the time of the Thaw in the Soviet Union: the Stalinist regime had been officially condemned and there was now more freedom for Russian society to offer hopeful acceptance to each new movement of creative and artistic expression. Some were perceived as major events, even if they had no substance, some were enveloped in an atmosphere of civic re-awakening (for example, Pasternak’s Dr Zhivago). Subsequently, the 1950s could be regarded as the completion of the ‘charismatic cycle’ in Russian culture, which had been forcibly interrupted by Stalinist ideologues. In any event, it was and still is thought that the Eleventh Symphony appeared at just the right time, that it embodied the spirit of the time—the adventure—of the Thaw. Presenting the composer with the highest award the nation could give, the Lenin Prize, in 1958, was not just an act of official approval but a sign of society’s supportfor topical and honest art. In later years, the symphony was sometimes criticized as an ‘officially inspired’ work, or its artistic merit was deemed to be compromised due to its very specific content. Nowadays, however, we are ready to grasp its deep symbolic structure and able to understand it as an imprint of life’s experiences and thoughts obscured for so long in a thicket of Soviet ideology, until Shostakovich expressed them. We could perhaps be allowed to apply to the Eleventh Symphony the description given by Shostakovich’s widow, Irina, to the Twelfth, the ‘twin’ symphony: ‘One of the most magnificent and most tragic works of the twentieth century’. The Symphony is subtitled ‘1905’. This of course refers to the First Russian Revolution, an almost insane attempt at total reconstruction of the Russian empire on extremely democratic lines, as described by Sergei Witte in his October Manifesto of 1905. Shostakovich, born in 1906, was able to transpose his childhood impressions of this formative environment across the canvas of his life and, at the age of 51, produce the Eleventh Symphony. We have to remember that the Thaw in the 1950s was for him a particularly difficult time both personally and politically. Never before had he written such a large number of commissioned works and entrance music, and he was clearly thirsting for new and serious creative challenges. Did he find these in the Eleventh Symphony? In any event, we know from one of his memoirists that he attached great importance to it (as recorded in a letter to Isaak Glikman). In contradistinction to the Tenth Symphony (1953) where the prime and inviolable significance is found in the autobiographical themes, in the Eleventh, the composer overcomes his past, or at any rate puts some distance between the past and himself. Shostakovich often wrote music on revolutionary themes: indeed in Soviet Russia there were constant echoes of such themes in the ‘songs of the masses’. The Eleventh can be greeted with nostalgia, as it was by Anna Akhmatova the poet, for example, or responded to with ridicule and venom, as did Bulgakov in Heart of a Dog, depicting a choir conducted by a petty Soviet boss. Shostakovich occupied a particular position in artistic life. He resisted the mass hypnosis of the time and did not indulge in mockery; he simply gave symphonic voice to five ‘revolutionary songs’ with their everyday connotations and marching rhythms. In this he fulfilled his duty as a witness, conveying an imprint of events and preventing the songs of a tragic period in Russian history from falling into complete oblivion. All these factors, I believe, explain the disparity and variety in interpretations of the Eleventh Symphony. Sometimes it is described as a kind of film score, clear and detailed. Sometimes reference is made to a purely contemporary subtext of ‘revolutionary subjects’: Shostakovich is not really describing the events in Palace Square or the Bloody Sunday of 1905, but more recent events of Soviet state violence. For better clarification we need only look at the Symphony’s tonal composition. The composition of the symphony is trochaic: the maximum content and emotional charge occur in the first two of the four parts and it is here that the most important material is concentrated. The critical moments are the song themes—O Tsar, our Little Father, look around you and Bare your heads—repeated as variations in all parts of the work. The Palace Square (the first movement) performs the function of a prologue. The 9th of January (the second movement) divides into the well-defined sections of Demonstration and Massacre and becomes the dramatic centre of the Symphony. The slow Eternal Memory is perceived as an episode before the final moments (Tocsin) when the emotional tension returns and intensifies. These tonal subjects can hardly be described as simple or predictable, in the style of film music. Given the marked rhythmic contrast between the opening and closing sections, the whole symphony being played without a break, and also given the creative and artistic quality of the piece and the underlying drive of the two central melodic themes (no longer quotations but products of the composer’s own inspiration), the Eleventh Symphony can be considered a great work, standing comparison with other scores where Shostakovich’s genius is undisputed in post-Soviet Russia (the Fourth, Eighth and Fifteenth Symphonies). The most grandiose of the images in this symphony is St Petersburg itself. No one has ever managed to convey in sound, with such incredible artistry, the vastness of St Petersburg’s open spaces or the desert of silent squares (described by the poet Annenskii) as Shostakovich does in the first movement of the Eleventh. To achieve this, the composer had to have been born in Petersburg and witnessed the time, immediately after the Revolution, when life had left the city. From the silence of the Palace Square emerge the melodies of prison songs: this is another revelation that the symphony brings us. Prison was part of life’s experience for millions of people in Soviet Russia, but who in Soviet art described it as Shostakovich did? The fear and anguish of the prison—a place without a voice—permeates the prologue to the Symphony. Then the procession, long and arduous, arrested by the trumpet call. The apocalyptic spectacle of mass murder unfolds: the Ninth of January massacre. Eyewitnesses spoke about the terror experienced during this massacre: the assembled masses not understanding at first what the bugle call heralded, and then all around perishing under the hail of bullets—policemen and priests, mothers with children in their arms, and old men carrying portraits of the Tsar. Shostakovich, as a great Russian composer, had the resolve both to demonstrate the violence (with the percussion expressing volleys of rifle fire) and to curse it through powerful tutti, interrupting the bubbling flow of sound in the culminating moments of the Ninth of January massacre. Shostakovich had given the dead a requiem. At the beginning of the third movement, when the violas hold the melody of You fell a victim (the Funeral March of the Revolution) for thirty four bars, or when the cor anglais plays its momentous funeral solo in the final movement, the listener is seized with the fear, as always happens, that the surrounding silence might stop and in that silence a lone voice will speak out. Then comes the understanding that the Eleventh Symphony exists not for the ‘revolutionary songs’ but to express deeply personal feelings of pain and sorrow. It is hardly accidental that, in the absolutely confessional Eighth Quartet (1960), Shostakovich once again quotes You fell a victim, this time transforming the melody into a tonal epilogue to his own fate. The Eleventh Symphony is multidimensional and its semantic interior is very rich. At times, especially in the two last parts, it is as though, in wishing to be historically accurate if not documentary, the composer’s creative drive has produced unexpected artistry. Shostakovich’s genius for tragedy is discernible everywhere in this work: the Petersburg landscape and the ‘Revolution Songs’ have become symbols of tragedy. And so the music raises this symphony to the open spaces of the highest truth. While the main theme here may be tragedy, in Shostakovich’s work there is never space for evasiveness or silence. This one-movement composition for orchestra and chorus written by the 21-year-old Dmitri Shostakovich was only retrospectively named the Second Symphony: when it was first presented in public in 1927, it was called To October and was intended as a musical celebration to mark the tenth anniversary of the October Revolution. The composer had no hesitation in accepting the State Music Publishing House’s commission, also accepting without any particular resistance the slogan-filled text by the poet Alexander Bezymensky proposed by the publishing house. Perhaps it was this text that posed a problem for Shostakovich. In any case, work on the score extended for half a year, although upon listening to the seventeen-minute symphony we fall under the impression that it was created in one unstinting effort. The Second Symphony is certainly not one of the composer’s better-known works (even in the St Petersburg Philharmonic, the citadel of Shostakovich’s music, it has been performed only fourteen times in sixty years; for thirty-five years it was not performed at all). But the symphony invariably strikes all who listen to it. Could anyone have expected an officially commissioned composition to contain such linguistic and stylistic radicalness? Some might say that in the 1920s, masters of the young Soviet arts such as the artists Filonov, Tatlin and Malevich, and the film directors Meyerhold and Eisenstein were working in a similar vein. Yet of all the composers, only Shostakovich (most of all in his Second Symphony and in the opera The Nose) dazzled with his originality, moreover this was an originality that also captivated people, meaning it was accessible to ordinary people, for whom emotion is the most important aspect in art. It is like the pictures of the brilliant avant-garde painter Pavel Filonov: at first their harsh colourful accents affect the viewer, and then the viewer starts to discern in them the outlines of a living scene. In the Second Symphony there is an episode (before the chorus starts up) which the author named Death of a Small Child; listeners may know nothing about the real story behind this episode (during the revolution the young Shostakovich witnessed the killing of a baby on the streets), they may fail to find anything depictive in the music, yet the alternating themes of the violas and clarinets compel the listeners to concentrate wholeheartedly. In any case, the composer had in mind the sympathetic and heartfelt public when he said of the symphony: 'It is music that is simple and accessible for the modestly off'. The Second Symphony is also unique in that, given the strangeness of the musical language and the complete absence of a sonata scheme, it possesses an absolute compositional clarity or, to put it another way, a distinct, if unstated, programme. At the beginning is a 'dark chaos', intertwining lines of string instruments and a quickening rhythmic pulse. The colour emerges: the brass wind instruments enter with their comparatively bright melodic material. A new phase of development: fermentation. One on top of the other, the voices of the thirteen instruments gradually build up (beginning with the violin), the atonal sound mass vibrates over fifty-three bars. The Cosmos is born out of chaos, emitting a vast quantity of energy! There is the social cosmos too: from 'the lower depths' comes liberation, with thunderous cries of protest and declamation dominating the symphony. After a contrasting interlude (Death of a Small Child), at the signal of the factory whistle, which is incorporated into the make-up of the orchestra, the chorus begins to sing. In the choral finale, all the pressure of the montage dramaturgy adopted by Shostakovich for his Second Symphony is resolved; this finale is a hymn with firm tonal constancies, with a raised intonation which does not hamper, and even intensifies Bezymensky’s propagandist text. In appraisals of the Second Symphony critics often take an unusual angle: they try to understand where its avant-garde style comes from. They mention Shostakovich’s elder contemporaries—Hindemith, Stravinsky, Honegger—and they find no direct correlation with the music of the Second Symphony, bearing in mind that the young Soviet composer was well acquainted with their creativity. It could be argued that this music is the product of sheer genius, as was, for example, the music of Charles Ives from a previous generation of composers and from another land. Of course, there is no doubt about Shostakovich’s brilliant training and broad outlook, but, after all, the compositional approach which he used in the Second Symphony appeared in modern music only thirty-five to forty years later (with Ligeti and Penderecki). The fact that the mature Shostakovich avoided speaking of it can be explained by his unpleasant memories surrounding the reasons for its appearance. In any case, the fantastically imposing fugue in the first movement of the Fourth Symphony (“the horror of the human multitude”, as I once dared call it) owes much to the thirteen-voice episode in the Second Symphony. And surely the citations from the 'revolutionary songs' in the Eleventh and Twelfth Symphonies contain echoes of the content of To October (as the Second Symphony was called). It is another matter that here, in the Second Symphony, folklore material is merely hinted at, and that on the whole this symphony is decisively free of the ideology of the Bolshevist state and likewise the ideology of classical music. Yet it could be claimed, without fear of contradiction, that the young Shostakovich’s score is the incarnation of the Revolution, both in the renewal of language and in the power of its creative impulse. Chostakovitch a composé sa Onzième Symphonie en 1957. Politiquement, c’était l’époque du dégel en Union soviétique: le régime stalinien ayant été condamné officiellement, la société russe était à présent plus libre d’accepter, pleine d’espoir, les nouveaux mouvements de création et artistique. Certains étaient perçus comme des évènements majeurs, même s’ils manquaient de substance, d’autres suscitaient une atmosphère de réveil civique (Docteur Jivago de Pasternak, par exemple). En conséquence de quoi l’on peut considérer les années cinquante comme la reprise du «cycle charismatique» de la culture russe, qui avait été brutalement interrompu par les idéologues staliniens. Quoi qu’il en soit, il est clair depuis toujours que la Onzième Symphonie est arrivée exactement au bon moment, qu’elle incarne l’esprit du dégel—l’aventure. Décerner au compositeur en 1958 la plus haute récompense que la nation ait à proposer, le prix Lénine, n’était pas seulement un acte d’approbation officielle mais un signe que la société russe soutenait l’art authentique de son époque. Cette symphonie a pour sous-titre «1905». Ceci fait évidemment référence à la première révolution russe, tentative presque folle de reconstruction totale de l’empire russe sur des bases démocratiques, exposées par Sergueï Witte dans son Manifeste d’octobre 1905. Chostakovitch, né en 1906, a su transposer ses impressions de cette époque formatrice tout au long de sa vie et produire, à 51 ans, la Onzième Symphonie. N’oublions pas que le dégel, dans les années cinquante, était un moment particulièrement difficile pour lui, tant sur le plan personnel que politique. Il n’avait jamais écrit autant d’œuvres de commande et de musiques d’entrée et avait manifestement soif de nouveaux défis créatifs sérieux. Les a-t-il trouvés dans la Onzième Symphonie? En tout cas, nous savons par l’un de ses biographes qu’il y attachait une grande importance (comme en témoigne sa lettre à Isaak Glikman). Contrairement à la Symphonie nº 10 (1953) dont le sens premier et inviolable réside dans les thèmes autobiographiques, dans la Onzième, le compositeur surmonte son passé, ou du moins met une certaine distance entre lui et ce passé. Chostakovitch a souvent composé sur des thèmes révolutionnaires, qui revenaient de fait constamment en Russie soviétique dans les «chants des masses». La Onzième peut être accueillie avec nostalgie, comme l’a fait la poétesse Anna Akhmatova, par exemple. Au contraire, la «musique révolutionnaire» a pu être ridiculisée assez méchamment, comme par Boulgakov dans Cœur de chien, où il décrivait une chorale dirigée par un chef soviétique médiocre. Mais Chostakovitch occupait une place particulière dans la vie artistique. Il a résisté à l’hypnose de masse de l’époque et ne s’est pas livré à la raillerie; il a simplement donné une voix symphonique à cinq «chants révolutionnaires» avec leurs connotations quotidiennes et leurs rythmes cadencés. En cela, il a accompli son devoir de témoin, transmettant des évènements et empêchant que les chants d’une période tragique de l’histoire russe ne tombent totalement dans l’oubli. Il me semble que tous ces éléments expliquent la disparité et la variété des interprétations au sujet de la Symphonie nº 11. Parfois, elle est décrite comme une sorte de bande-son cinématographique, claire et détaillée. Parfois, on n’y voit qu’une allusion au contemporain derrière les «sujets révolutionnaires»: Chostakovitch ne décrirait pas vraiment les évènements du Palais d’Hiver ou du Dimanche rouge de 1905, mais ceux plus récents de la violence d’État soviétique. Pour y voir plus clair, il nous suffit d’étudier la composition tonale de la symphonie. La composition de la symphonie est trochaïque, c’est-à-dire que le summum du contenu et de la charge émotionnelle se trouve dans les deux premiers tableaux où se concentrent les thèmes les plus importants. Les moments décisifs sont les chants—O Tsar, notre petit père, regardez autour de vous et Découvrez-vous la tête—répétés sous forme de variations dans les quatre parties de l’oeuvre. Le Palais d’Hiver (le premier mouvement) joue le rôle de prologue. Le Neuf janvier (le deuxième mouvement) se divise en deux sections bien définies, la manifestation et le massacre, et devient l’axe dramatique de la symphonie. Le lent Mémoire éternelle est perçu comme un épisode avant les derniers moments (Tocsin) où la tension émotionnelle revient et s’intensifie. On peut difficilement affirmer que ces sujets tonals sont simples ou prévisibles comme de la musique de film. Étant donné le contraste rythmique marqué entre le premier et le dernier tableau, toute la symphonie se déroulant sans une seule pause, étant donné également le haut niveau artistique du morceau et la puissance des deux thèmes mélodiques centraux (qui ne sont plus des citations mais des produits de la propre inspiration du compositeur), la Symphonie nº 11 peut être considérée comme une grande œuvre comparable à d’autres partitions à propos desquelles personne en Russie post-soviétique ne conteste le génie de Chostakovitch (les Quatrième, Huitième et Quinzième Symphonies). La plus grandiose des images de cette symphonie, c’est Pétersbourg. Personne n’a jamais réussi à traduire en musique avec un art aussi consommé l’immensité des grands espaces de Saint-Pétersbourg ou le côté désertique des places silencieuses (décrit par le poète Annensky), comme Chostakovitch le fait dans le premier mouvement de la Onzième. Pour y arriver, il fallait y être né et avoir vécu l’époque, juste après la révolution, où la vie avait abandonné la ville. Du silence du Palais d’Hiver émergent les mélodies des chants de prisonniers: c’est une autre révélation que cette symphonie nous offre. La prison faisait partie de la vie de millions de personnes en Russie, mais qui a su la décrire comme Chostakovitch? La peur, l’angoisse de la prison—lieu sans voix—imprègnent le prologue de la Symphonie. Ensuite c’est la procession, longue et pénible, stoppée par la sonnerie de la trompette. Et enfin le spectacle apocalyptique de la tuerie, avec le massacre du 9 janvier. Des témoins oculaires racontaient la terreur ressentie lors de ce massacre: les masses rassemblées qui ne comprirent pas tout de suite ce que l’appel du clairon annonçait, puis tout autour les gens qui tombaient sous un déluge de balles—agents de police, prêtres, mères serrant leurs petits et vieillards portant des portraits du tzar. Chostakovitch, en grand compositeur russe, était déterminé à la fois à montrer la violence (les percussions illustrant les rafales de tir) et à la maudire à travers de puissants tutti, qui interrompent le flot sonore bouillonnant au plus fort du massacre du 9 janvier. Chostakovitch a offert un requiem aux morts. Au début du troisième mouvement, lorsque les altos soutiennent la mélodie du Chant des martyrs (la marche funèbre de la révolution) pendant trente-quatre mesures, ou lorsque le cor anglais joue son mémorable solo funèbre du dernier mouvement, nous sommes saisis d’effroi, comme toujours, à l’idée que le silence environnant pourrait se rompre, pour laisser place à une voix isolée. Puis nous commençons à comprendre que la Onzième Symphonie existe non pour les «chants révolutionnaires» mais pour exprimer des sentiments profondément personnels de douleur et de tristesse. Ce n’est pas par hasard si, dans la véritable confession qu’est le Quatuor nº 8 (1960), Chostakovitch cite à nouveau le Chant des martyrs, transformant cette fois la mélodie en un épilogue à son sort personnel. La Onzième Symphonie est multidimensionnelle et son contenu sémantique très riche. Parfois, surtout dans les deux dernières parties, on dirait que, dans son désir de précision historique sinon documentaire, la pulsion créative de Chostakovitch a atteint un niveau artistique inattendu. Son génie pour la tragédie est perceptible partout dans son œuvre: le cadre de Pétersbourg et les «chants révolutionnaires» sont devenus des symboles de cette tragédie. Aussi la musique élève-t-elle cette symphonie jusqu’aux espaces sans fin de la plus pure vérité. Ici, le sujet principal est peut-être la tragédie, mais dans l’œuvre de Chostakovitch il n’y a jamais de place pour les faux-fuyants ou le silence. À l’origine, cette pièce en un mouvement pour chœur et orchestre composée par Dmitri Chostakovitch à l’âge de 21 ans ne s’intitulait pas Symphonie nº 2: à sa création en 1927, elle avait pour titre À Octobre—dédicace symphonique et se voulait une commémoration de la Révolution russe dont c’était le dixième anniversaire. Le compositeur n’avait pas hésité à accepter cette commande des Éditions musicales d’État, ni même rechigné devant le texte de propagande du poète Alexandre Bezymenski qu’on lui avait confié. On peut se demander si ce texte ne lui posa pas toutefois problème. La composition de cette pièce symphonique de dix-sept minutes exigea, en effet, quelque six mois d’effort, même si à l’écoute on a l’impression qu’elle fut écrite d’une seule traite. La Symphonie nº 2 est loin d’être une des œuvres les plus connues du compositeur (même l’Orchestre philharmonique de Saint-Pétersbourg, véritable champion de la musique de Chostakovitch, ne l’a jouée que quatorze fois en soixante ans; et elle fut totalement absente de son répertoire pendant trente-cinq ans). Cette symphonie n’en est pas moins saisissante à l’écoute. Qui aurait pu s’attendre à un langage et un style musical d’une nouveauté aussi radicale? Certains diront que dans les années 1920, les artistes qui dominaient la scène culturelle de la jeune république soviétique comme Filonov, Tatline, Malevitch et les cinéastes Meyerhold et Eisenstein travaillaient dans le même esprit. Néanmoins, de tous les compositeurs, Chostakovitch est le seul à éblouir par son originalité (surtout avec sa Symphonie nº 2 et son opéra Le Nez), et à captiver le public par son originalité même. C’est que sa musique est accessible aux gens ordinaires, pour qui l’émotion est l’élément qui doit primer dans l’art. Ainsi en est-il des tableaux du brillant peintre d’avant-garde Pavel Filonov: on est d’abord frappé par la stridence des couleurs et puis progressivement on commence à discerner les contours d’une scène avec des personnages. Dans la Symphonie nº 2, il y a un épisode (juste avant l’entrée du choeur) qui représente, dit le compositeur, «la mort d’un petit enfant»; même si l’on ne sait rien de l’événement en question (pendant la Révolution, le jeune Chostakovitch a été témoin du meurtre d’un enfant dans la rue), et même si la musique n’évoque aucune scène précise en nous, la manière dont les thèmes sont repris tour à tour par les altos et les clarinettes force volontiers l’attention. C’est à ce public bienveillant et sensible que pensait le compositeur pensait lorsqu’il disait de sa symphonie: «C’est une musique simple et accessible aux plus modestes». La Symphonie nº 2 est également unique en son genre en ce sens que malgré l’étrangeté de son langage musical et l’absence de forme sonate, elle relève d’une écriture d’une clarté absolue, autrement dit d’un programme implicite mais néanmoins précis. Tout commence par un «sombre chaos» où s’entrelacent les cordes et le tempo s’accélère. La couleur jaillit à l’entrée des cuivres don’t le matériau mélodique brille par contraste. Vient ensuite un nouveau développement: la fermentation. Les voix des treize instruments s’empilent progressivement les unes sur les autres (à commencer par le violon), et la masse atonale résonne sur cinquante-trois mesures. L’univers naît du chaos en libérant une énorme quantité d’énergie! L’univers, c’est aussi la société: la libération émerge des «profondeurs» avec des cris de protestation et des proclamations retentissantes qui dominent la symphonie. Après le contraste de l’épisode de «la mort d’un petit enfant», au signal du sifflet d’usine, incorporé dans l’orchestre, le choeur se met à chanter. Toute la tension issue du montage dramaturgique mis au point par Chostakovitch trouve sa résolution dans le finale choral de la Symphonie nº 2, hymne dont la constance tonale et la force d’intonation ne nuit en rien, voire même renforce le texte de propagande de Bezymenski. La critique s’empresse souvent, contre toute attente, de chercher à comprendre l’origine du style avant-gardiste de la Symphonie nº 2. Elle évoque alors les aînés de Chostakovitch—Hindemith, Stravinski, Honegger—mais sans découvrir de lien direct entre la Symphonie nº 2 et leurs œuvres, que le jeune compositeur soviétique connaissait bien. Cette musique est donc, pourrait-on dire, le produit d’un pur génie, comme le fut celle de Charles Ives quelques décennies auparavant et dans un autre pays. La brillante formation musicale de Chostakovitch et son ouverture d’esprit ne font aucun doute; ceci dit, l’écriture dont relève la Symphonie nº 2 ne trouve d’équivalent dans la musique moderne que trente-cinq à quarante ans plus tard (avec Ligeti et Penderecki). Si Chostakovitch évite plus tard de s’expliquer là-dessus, c’est probablement parce que cela lui rappelle de pénibles souvenirs. Quoi qu’il en soit, la fugue extraordinairement imposante du premier mouvement de la Symphonie nº 4 («l’horreur de la multitude humaine», comme j’ai osé l’appeler) doit beaucoup à l’empilement des treize voix dans la Symphonie nº 2. En outre, les citations de «chants révolutionnaires» des Symphonies nos 11 et 12 ne manquent pas de rappeler À Octobre (rebaptisée par la suite Symphonie nº 2). Par ailleurs, le folklore russe est à peine évoqué dans la Symphonie nº 2 et, dans l’ensemble, l’idéologie de l’État bolchévique comme celle de la musique classique lui sont totalement étrangères. On pourrait néanmoins affirmer, sans craindre de se contredire, que la partition du jeune Chostakovitch est à l’image même de la Révolution, tant est nouveau son langage et puissant l’élan créateur dont elle procède. Schostakowitsch schrieb seine Elfte Sinfonie 1957, in der Zeit des politischen Tauwetters in der Sowjetunion. Das stalinistische Regime war offiziell verurteilt worden, die Gesellschaft zeigte sich insgesamt aufnahmebereiter für neue Bewegungen im kreativen und künstlerischen Ausdruck. Einige wurden als großartige Ereignisse gefeiert, auch wenn sie praktisch substanzlos waren, andere als ein Wiederaufleben von Zivilstaatlichkeit begrüßt (wie etwa Pasternaks Doktor Schiwago). Rückblickend könnte man die fünfziger Jahre als Vollendung des „charismatischen Zyklus“ in der russischen Kultur beschreiben, der von der stalinistischen Ideologie gewaltsam unterbrochen worden war. Damals hieß es, Schostakowitschs Elfte sei im richtigen Augenblick erschienen, sie verkörpere den Geist der Zeit, das Abenteuer des Tauwetters. Das trifft auch heute noch zu. Dass dem Komponisten 1958 die höchste Auszeichnung zuerkannt wurde, die der Staat verleihen konnte—der Lenin-Orden—, war nicht nur ein Zeichen offizieller Billigung, sondern auch ein Symbol für die gesellschaftliche Unterstützung aktueller, aufrichtiger Kunst. Die Sinfonie trägt den Untertitel „1905“—das Jahr der ersten Russischen Revolution. Es war ein fast wahnwitziger Versuch, dem russischen Reich eine demokratische Gestalt zu geben, wie Sergei Witte sie in seinem Oktobermanifest von 1905 umrissen hatte. Schostakowitsch, geboren 1906, gelang es, seine Kindererinnerungen dieser prägenden Erlebnisse über die Spanne seines Lebens hinweg zu transponieren und im Alter von 51 die Elfte Sinfonie zu schreiben. Dabei dürfen wir nicht vergessen, dass das Tauwetter der fünfziger Jahre für ihn persönlich und auch politisch eine besonders schwierige Zeit war. Nie zuvor hatte er derart viele Auftragskompositionen und Gelegenheitsmusiken geschrieben, es verlangte ihn unverkennbar nach neuen, ernsthaften kreativen Herausforderungen. Stellte die Elfte eine solcher Herausforderung für ihn dar? Zumindest wissen wir von einem seiner Memoirenschreiber, dass er der Sinfonie große Bedeutung beimaß (wie es in einem Brief an Isaak Glikman heißt). Im Gegensatz zur Zehnten Sinfonie (1953), deren Bedeutung in den autobiografischen Themen liegt, überwindet der Komponist hier seine Vergangenheit, oder zumindest schafft er eine gewisse Distanz zu ihr. Schostakowitsch schrieb vielfach Musik mit revolutionären Sujets—in der Sowjetunion fanden derartige Themen häufig in den „Liedern der Massen“ einen Nachhall. Man kann die Elfte mit Nostalgie betrachten, wie etwa die Lyrikerin Anna Achmatowa, oder man kann „revolutionäre Musik“ der bitteren Lächerlichkeit preisgeben, wie Bulgakow es 1925 in seiner Erzählung Hundeherz tat, in der ein subalterner Parteifunktionär als Chordirigent fungiert. Schostakowitsch nahm im künstlerischen Leben seiner Heimat einen ganz eigenen Platz ein. Er entzog sich der damals üblichen Massenhypnose, verzichtete auf jeden Spott und beschränkte sich darauf, fünf „Revolutionslieder“ mit ihren alltäglichen Anspielungen und ihrem Marschrhythmus sinfonisch aufzubereiten. Damit erfüllte er seine Pflicht als Zeitzeuge, vermittelte ein Bild der Ereignisse und verhinderte, dass die Lieder einer tragischen Zeit in der russischen Geschichte völlig in Vergessenheit gerieten. Meines Erachtens erklären all diese Faktoren die vielen unterschiedlichen Interpretationen der Elften. Bisweilen wird sie als klar und detailliert in der Art einer Filmmusik geschildert, dann wieder wird lediglich auf den ausschließlich zeitgenössischen Subtext der „revolutionären Themen“ verwiesen: In Wirklichkeit beschreibe Schostakowitsch gar nicht die Vorgänge auf dem Palastplatz und am Blutsonntag 1905, sondern neuere Ereignisse der sowjetischen Staatsgewalt. Zur Klärung ist es notwendig, sich mit der tonalen Komposition der Sinfonie zu beschäftigen. Die Komposition der Sinfonie ist trochäisch: Gehalt und emotionale Spannung ballen sich in den ersten zwei der vier Teile, hier konzentriert sich das wesentliche Material. Wichtig sind die Themen der Lieder—O Zar, unser kleiner Vater, sieh dich um und Entblößt den Kopf—, die in allen Teilen mit Variationen wiederholt werden. Der erste Satz, „Der Palastplatz“, übernimmt die Funktion eines Prologs, der nächste, „Der 9. Januar“, ist klar unterteilt in Demonstration und Blutbad und bildet dramatisch den Mittelpunkt des Werks. Der langsame Satz „Ewiges Andenken“ kann als Zwischenspiel gelten vor den letzten Momenten—„Sturmgeläut“—, in denen die emotionale Spannung in noch intensiverer Gestalt wiederkehrt. Diese tonalen Themen können kaum als schlicht oder berechenbar—das heißt, als Filmmusik—beschrieben werden. Wenn man den auffälligen rhythmischen Kontrast zwischen den einleitenden und den abschließenden Passagen bedenkt, wobei die gesamte Sinfonie ohne Pause gespielt wird, und darüber hinaus auch die kreative und künstlerische Qualität des Werks sowie das zugrunde liegende Momentum der beiden zentralen melodischen Themen (nicht mehr Zitate, sondern der ureigenen Phantasie des Komponisten entsprungen), muss man die Elfte als großes Werk bezeichnen, das den Vergleich mit den anderen Partituren Schostakowitsch, deren Genialität im postsowjetischen Russland nicht mehr in Frage gestellt wird (die Vierte, die Achte und die Fünfzehnte), nicht zu scheuen braucht. Die großartigsten Bilder in dieser Sinfonie schildern St. Petersburg.Niemand verstand es, die Weite des Raums und die Immensität der stillen Plätze (wie der Dichter Annenskij sie beschreibt) musikalisch mit solcher Meisterschaft darzustellen wie Schostakowitsch im ersten Satz der Elften. Das konnte ihm auch nur gelingen, weil er in der Stadt geboren war und die Zeit direkt nach der Revolution miterlebt hatte, als jedes Leben aus der Stadt verschwunden war. Aus der Stille des Palastplatzes heraus erklingen die Melodien der Gefängnislieder: eine weitere Offenbarung, mit der die Sinfonie aufwartet. Das Gefängnis war eine Erfahrung, die in der Sowjetunion Millionen von Menschen machten, doch welcher sowjetische Künstler beschrieb sie so nachdrücklich wie Schostakowitsch? Die Angst und Qual, die ein Gefängnis – als Ort ohne Stimme – heraufbeschwört, prägen den Prolog der Sinfonie. Darauf folgt die lange, mühselige Prozession, die von einem Trompetenruf zum Stillstand gebracht wird. Dann entfaltet sich die apokalyptische Szene des Massakers: das Blutbad des 9. Januar. Augenzeugen berichteten vom Grauen dieses Gemetzels: zunächst begriffen die Versammelten nicht, was der Trompetenruf zu bedeuten hatte, bis rings um sie her Menschen im Kugelhagel starben – Polizisten und Priester, Mütter mit Kindern auf dem Arm, alte Männer mit dem Porträt des Zaren in der Hand. Als großer russischer Komponist machte Schostakowitsch es sich zur Aufgabe, die Gewalt zu schildern (wobei die Schlaginstrumente die Gewehrsalven versinnbildlichen) und zu verdammen, und zwar mit mächtigen Tutti, die den schäumenden Tonfluss an den Höhepunkten des Blutsonntags unterbrechen. Damit hatte Schostakowitsch den Toten ein Requiem gegeben. Zu Beginn des dritten Satzes, wenn die Bratschen die Melodie von Du wurdest Opfer (der Trauermarsch der Revolution) über vierunddreißig Takte hinweg halten, oder wenn das Englischhorn im letzten Satz sein ergreifendes Trauersolo spielt, ergreift den Zuhörer die Angst, die ihn umgebende Stille könnte aufhören und eine einsame Stimme zu sprechen beginnen. Da stellt sich die Erkenntnis ein, dass der Sinn der Elften Sinfonie mitnichten in den „Revolutionsliedern“ besteht, sondern vielmehr darin, den persönlichen Gefühlen von Schmerz und Trauer Ausdruck zu verleihen. Es ist wohl kaum ein Zufall,dass Schostakowitsch im ausgesprochen bekennenden Achten Streichquartett (1960) wiederum Du wurdest Opfer zitiert, wobei er die Melodie als Epilog zu seinem eigenen Schicksal gestaltet. Die Elfte Sinfonie ist in ihren Dimensionen ausgesprochen vielschichtig, ihr innerer Gehalt ist reich. Insbesondere in den beiden letzten Teilen bekommt man den Eindruck, dass der Komponist durch den Wunsch, historisch korrekt, wenn nicht gar dokumentarisch zu arbeiten, eine unerwartete künstlerische Meisterschaft erreicht. Überall scheint in diesem Werk seine großartige Gabe fürs Tragische durch: die Landschaft von St. Petersburg und die „Revolutionslieder“ sind zum Symbol der Tragödie geworden. Und so erhebt die Musik diese Sinfonie zu den weiten Räumen der höchsten Wahrheit empor. Das Hauptthema mag zwar Tragik sein, doch gibt es in Schostakowitschs Werk nie Raum für Ausflucht oder Schweigen. Diese einsätzige Komposition für Chor und Orchester, geschrieben vom damals 21-jährigen Dmitri Schostakowitsch, wurde erst später zur Zweiten Sinfonie umbenannt. Als die Musik 1927 der Öffentlichkeitvorgestellt wurde, hieß sie „An den Oktober“ und war ein Werk zur Feier des zehnten Jahrestags der Oktoberrevolution. Es bereitete dem Komponisten keine Probleme, einen Auftrag des staatlichen sowjetischen Musikverlags anzunehmen, und er akzeptierte auch ohne größere Einwände den ideologieträchtigen Text des Dichters Alexander Besymenski, den der Verlag vorschlug. Womöglich erwies sich der Text dann allerdings doch als problematisch für Schostakowitsch, denn die Arbeit an der Musik zog sich über ein halbes Jahr hin. Beim Hören der 17-minütigen Sinfonie erweckt sie jedoch den Eindruck, als sei sie in einem breiten Wurf geschrieben. Einzigartig an der Zweiten Sinfonie ist auch, dass sie—wenn man die ungewöhnliche musikalische Sprache bedenkt sowie das völlige Fehlen einer Sonatenform—eine außergewöhnliche kompositorische Klarheit besitzt, man könnte auch sagen: ein unverkennbares, wenn auch unerläutertes, Programm. Anfangs herrscht „dunkles Chaos“: verwobene Streicherlinien und ein sich beschleunigender rhythmischer Schlag. Langsam nimmt die Musik Farbe an, die Blechbläser setzen mit ihrem eher hellen Melodiematerial ein. Ein neuer Abschnitt der Entwicklung beginnt: Fermentation. Allmählich bauen sich (ausgehend von der Geige) übereinander die Stimmen der dreizehn Instrumente auf, die atonale Klangmasse vibriert über 53 Takte hinweg. Aus dem Chaos wird der Kosmos geboren, was unfassliche Energien freisetzt. Und es gibt auch einen sozialen Kosmos: Aus den „unteren Tiefen“ steigt die Befreiung auf, donnernde Protestrufe und Deklamationen beherrschen die Sinfonie. Nach einem kontrastierenden Zwischenspiel (Tod eines Kindes) setzt auf das Signal einer Fabriksirene hin—die ins Orchester integriert ist—der Chor ein. Im Chorfinale wird der Druck der Dramaturgie, den Schostakowitsch in dieser Sinfonie aufbaute, aufgelöst. Das Finale ist eine Hymne fester tonaler Konstanten und erhöhter Intonation, die die propagandistische Lyrik Besymenskis nicht behindert, sondern vielmehr unterstreicht. Bei der Beschäftigung mit dieser Sinfonie nehmen viele Kritiker eine ungewöhnliche Warte ein und versuchen, die Ursprünge ihres avantgardistischen Stils zu eruieren. Sie erwähnen Schostakowitschs ältere Zeitgenossen—Hindemith, Strawinski, Honegger—und finden von ihnen keine direkte Verbindung zur Musik der Zweiten, wiewohl der junge sowjetische Musiker mit deren Schaffen natürlich vertraut war. Man könnte die Meinung vertreten, diese Musik sei das Werk eines wahren Genies, wie etwa auch die Musik Charles Ives´ aus einer früheren Generation und einem anderen Land. An Schostakowitschs herausragender Ausbildung und seinem umfassenden Blick kann kein Zweifel bestehen, dennoch verblüfft, dass der kompositorische Ansatz, den er in der Zweiten Sinfonie verfolgte, in der modernen Musik erst 35 bis 40 Jahre später wieder zu hören war (bei Ligeti und Penderecki). Die Tatsache, dass der reife Schostakowitsch nicht gerne über dieses Werk sprach, hängt wohl mit den missliebigen Erinnerungen zusammen, die die Gründe für ihre Entstehung umgeben. Wie dem auch sei, die ungemein imposante Fuge im ersten Teil der Vierten Sinfonie („das Grauen der Menschenmenge“, wie ich es einmal nannte) ist stark der 13-stimmigen Passage in der Zweiten Sinfonie verpflichtet. Zweifellos klingt „An den Oktober“ auch in den Zitaten aus den Revolutionsliedern in der Elften und Zwölften Sinfonie an. Doch hier, in der Zweiten, ist das volkstümliche Material nur ahnungsweise zu hören, insgesamt fehlt dem Werk jede bolschewistische Staatsideologie und auch jede Ideologie der klassischen Musik. Dennoch kann man mit Fug und Recht behaupten, dass die Partitur des jungen Schostakowitschs eine Verkörperung der Revolution darstellt, sowohl in der Erneuerung der Sprache als auch in der Gewalt ihres kreativen Impulses. Одиннадцатая симфония была написана Д.Д. Шостаковичем в 1957 году. В Советском Союзе это были времена оттепели: сталинский режим получил официальное осуждение, и наше общество с надеждой встречало каждое движение художественного творчества в сторону большей свободы. Многое воспринималось как крупное событие, не являясь таковым по существу, многое окружалось атмосферой гражданского возбуждения (например, роман Б.Л. Пастернака «Доктор Живаго»). Впоследствии 1950-е годы стали выглядеть как завершение «харизматического цикла», насильственно прерванного в отечественной культуре сталинскими идеологами. Во всяком случае, считали и считают, что Одиннадцатая симфония Шостаковича появилась своевременно, что она воплотила собою дух и, если угодно, романтику оттепели и что присуждение композитору за эту симфонию высшей государственной награды—Ленинской премии (1958)—было не только актом официального одобрения, но и знаком общественной поддержки актуального и честного искусства. В последующие годы приходилось сталкиваться с репутацией Одиннадцатой симфонии как официально инспирированного сочинения, уязвимого в художественном отношении хотя бы из-за своей четкой программности. Но сегодня мы готовы к постижению ее глубокого символического плана и способны понять Одиннадцатую как запечатление важнейших жизненных смыслов, долгое время—до Шостаковича—остававшихся погребенными под толщей советской идеологии. Думаю, что у нас есть право распространить на Одиннадцатую симфонию слова, сказанные вдовой композитора И.А. Шостакович о следующей, Двенадцатой симфонии—этом «близнеце» Одиннадцатой: «Одно из величайших и трагичнейших произведений ХХ века». Симфония имеет подзаголовок «1905 год». Разумеется, речь идет о Первой русской революции, этой почти безумной попытке «полного переустройства Российской империи на крайне демократических началах» (С.Ю. Витте). Но не забудем, что Шостакович родился в 1906 году и мог мысленно двигаться по канве собственной жизни, сочиняя в 51-летнем возрасте Одиннадцатую симфонию. Тем более что «оттепельные» годы были для него очень трудными как в личном, так и в профессиональном смысле; никогда раньше не писал он такого количества заказной, проходной музыки, явно нуждаясь в новых и серьезных творческих мотивировках. Нашел ли их Шостакович в Одиннадцатой симфонии? Во всяком случае, Дмитрий Дмитриевич придавал ей большое значение (свидетельство мемуариста). В ней все не так, как в Десятой симфонии (1953), где автобиографические мотивы составляют главную и нерушимую ценность. В Одиннадцатой композитор преодолевает свое прошлое или, во всяком случае, отталкивает его от себя. Ведь Шостакович множество раз писал музыку на «революционные темы», притом, что в Советской России они постоянно напоминали о себе в облике массовых песен. Можно ностальгировать на этот счет, как делала, например, А.А. Ахматова, отзываясь на Одиннадцатую симфонию, можно ядовито осмеять «революционную музыку», как сделал М.А. Булгаков в «Собачьем сердце», изобразив хоровое пение под руководством маленького советского начальника. Шостакович занял особую позицию. Он преодолел гипноз массовости, ничего не вышучивая, а лишь изложив в симфоническом звучании пять «революционных песен» с их плоско-бытовой подоплекой и маршевыми ритмами. Но он выполнил и свой долг свидетеля, запечатлев все так, как оно было, и сумев уберечь от полного забвения песенный фон трагической российской истории. Полагаю, что всем этим объясняется различие в толкованиях Одиннадцатой симфонии. О ней говорят, как о варианте кино- партитуры, где все наглядно и дробно. Говорят и о сугубо современном подтексте «революционных сюжетов»: якобы не Дворцовую площадь и не Девятое января имел в виду Шостакович, а позднейшие акты советского государственного насилия. Многое сможет разъясниться, если мы подумаем о звуковом составе Одиннадцатой симфонии. Композиция симфонии хореична, то есть максимум содержательной и эмоциональной нагрузки приходится на первые две части из четырех. В них сосредоточен важнейший материал, важнейшие высказывания этого сочинения: песенные темы «Гой ты, царь наш» и «Обнажите головы», варьируемые на протяжении всех частей. «Дворцовая площадь» (первая часть) выступает в значении пролога, «Девятое января» (вторая часть) явственно делится на крупные разделы («Шествие», «Расстрел») и становится драматургическим центром симфонии. Медленная «Вечная память» воспринимается как эпизод перед финалом («Набат»), где эмоциональное напряжение возвращается и нарастает. Такой звуковой сюжет никак не назовешь простым и предсказуемым (на манер киномузыки). Добавим к этому яркий ритмический контраст между начальными и заключительными частями, притом, что все части исполняются без перерыва. А если еще указать на художественное качество и смысл двух центральных мелодических тем (они отнюдь не являются цитатами, а принадлежат самому композитору), то откроется величие Одиннадцатой симфонии даже в сравнении с теми партитурами Шостаковича, гениальность которых не вызывала сомнений в постсоветской России (Четвертая, Восьмая, Пятнадцатая симфонии). Самый грандиозный из них—образ Петербурга. Никому и никогда не удавалось с таким немыслимым мастерством воспроизвести в звуках огромность петербургских пространств или «пустыню немых площадей» (И.Ф. Анненский), с каким это сделано в первой части симфонии. Чтобы подобное произошло, Шостакович должен был родиться в Петербурге и застать те времена—сразу после революции,—когда из города уходила жизнь. В тишине Дворцовой площади слышны мелодии тюремных песен, и это—другое откровение Одиннадцатой симфонии. Тюрьма была частью жизненного опыта для миллионов людей в Советской России, но кто в советском искусстве сказал о ней, кроме Шостаковича, и так, как Шостакович? Страх и тоска тюремной неуслышанности пропитывают собой пролог симфонии. А далее—долгое и тяжелое шествие, остановившееся при звуках трубы. Открывается апокалиптическое зрелище массового убийства—расстрел Девятого января. Очевидцы говорили об ужасе этого расстрела, когда толпа вначале не поняла, что означает для нее сигнал трубы, когда под солдатскими пулями гибли все подряд—городовые и священники, матери с детьми на руках и старики, несшие портреты царя. Великому русскому композитору хватило воли для того, чтобы показать насилие (вплоть до ружейных залпов, сымитированных ударными инструментами) и проклясть его в мощных tutti, прерывающих клокочущий поток звучаний в кульминации «Девятого января». Шостакович и отпел погибших. Ведь когда в начале третьей части альты на протяжении 34-х тактов ведут песенную мелодию «Вы жертвою пали» или когда английский рожок в финале играет свое огромное траурное соло, вас охватывает страх, как всегда бывает, если рядом с вами устанавливается тишина и в тишине звучит чей-то одинокий голос. И в эти моменты вы понимаете, что Одиннадцатая симфония существует не ради «революционных песен», а ради глубоко личных чувств боли и скорби. Ведь недаром в абсолютно исповедальном Восьмом квартете (1960) Шостакович снова процитирует «Вы жертвою пали»—на этот раз превратив эту мелодию в звуковое послесловие к собственной судьбе. Воистину—многомерна Одиннадцатая симфония, и очень богат ее смысловой интерьер; временами кажется (особенно в двух последних частях), что композиторское творчество, желавшее быть исторически точным, если не документальным, принесло какой-то непреднамеренный результат. Трагический гений Шостаковича осветил здесь всё. Трагическими символами стали петербургский пейзаж и «революционные песни». Именно поэтому музыка Одиннадцатой симфонии поднимается в пространство высокой правды. Ведь если речь шла о трагедии, у Шостаковича никогда не находилось места уклончивости и умолчаниям. Одночастное сочинение для оркестра и хора, написанное 21-летним Дмитрием Шостаковичем, лишь задним числом было названо Второй симфонией: когда его впервые публично показали в 1927 году, оно называлось «Посвящение Октябрю» и предназначалось для музыкального празднества в честь десятилетия Октябрьской революции. Композитор без колебаний взял соответствующий заказ Государственного издательства, а также без особого сопротивления принял лозунговый текст поэта Александра Безыменского, предложенный издательством. Может быть, именно этот текст стал для Шостаковича проблемой. Во всяком случае, работа над партитурой растянулась на полгода, хотя при слушании семнадцатиминутной симфонии у нас создается впечатление, что она создана одним неослабевающим усилием. Вторая симфония—отнюдь не самое известное произведение композитора (ведь даже в Петербургской филармонии, этом оплоте музыки Шостаковича, оно было исполнено всего четырнадцать раз за шестьдесят лет; тридцать пять лет его не исполняли вообще). Но симфония неизменно поражает всех, кто ее слушает. Можно ли ожидать от сочинения на официальную тему такой радикальности языка и стиля? Скажут, что сходным образом работали в 1920-е годы мастера молодого советского искусства: художники Филонов, Татлин, Малевич, режиссеры Мейерхольд и Эйзенштейн. Но из композиторов только Шостакович (более всего во Второй симфонии и в опере «Нос») ошеломил новизной, притом новизна еще и увлекала, а значит, была доступна простому человеку, для которого эмоциональность важнее всего в любом искусстве. Это как на картине гениального авангардиста Павла Филонова: сначала она воздействует на вас резким красочным акцентом, а потом вы начинаете распознавать в ней контуры жизненной реальности. Во Второй симфонии есть эпизод (перед вступлением хора), который автор называл «Смерть младенца»; можно ничего не знать о реальной подоплеке этого эпизода (в годы революции юный Шостакович видел сцену уличного детоубийства), можно не находить в музыке ничего изобразительного, но следующие друг за другом темы альтов и кларнета заставляют слушателя душевно сосредоточиться. Во всяком случае, отзывчивую и чистосердечную публику имел в виду композитор, когда говорил о своей симфонии: «Музыка простая и доступна для небогатых». Вторая симфония уникальна еще и в том, что при непривычности музыкального языка и полном отсутствии сонатной схемы она обладает совершеннейшей композиционной ясностью или, если угодно, четкой, хотя и не объявленной программой. Вначале—«темный хаос», переплетающиеся линии струнных инструментов и учащающийся ритмический пульс. Колорит проясняется: вступают медные духовые с относительно ярким мелодическим материалом. Новая фаза развития: брожение. Друг над другом постепенно надстраиваются голоса тринадцати инструментов (начиная со скрипки), атональная звуковая масса вибрирует на протяжении пятидесяти трех тактов. Космос рождается из хаоса, выбрасывая огромное количество энергии! Можно говорить и о социальном космосе: «из низов» приходит освобождение, громовые возгласы протеста и утверждения занимают авансцену симфонии. После контрастной интермедии («Смерть младенца») по сигналу фабричного гудка, введенного в состав оркестра, начинает петь хор. В хоровом финале разрешается все напряжение монтажной драматургии, принятой Шостаковичем для своей Второй симфонии; этот финал есть гимн с твердыми тональными устоями, с приподнятой интонацией, которой не только не мешает, но и усиливает плакатный текст Безыменского. В суждениях о Второй симфонии часто появляется необычный угол зрения: пытаются понять, откуда взялся ее авангардный стиль. Называют старших современников Шостаковича: Хиндемита, Стравинского, Онеггера… и не находят у них никаких прямых соответствий с музыкой Второй симфонии, если считать, что молодой советский композитор хорошо знал их творчество. Склонен думать, что эта музыка есть продукт чистой гениальности, как было, например, у Чарльза Айвза из предыдущего композиторского поколения и из другой страны. Конечно, нет сомнений в блестящей выучке и широком кругозоре Шостаковича, но ведь те приемы письма, которые он использовал во Второй симфонии, появились в современной музыке только спустя тридцать пять—сорок лет (у Лигети, Пендерецкого). От этой симфонии сам ее автор немало получил в будущем, а то, что зрелый Шостакович на словах чуждался ее, можно объяснить неприязненными воспоминаниями о причинах ее появления. Во всяком случае немыслимо впечатляющее фугато в первой части Четвертой симфонии («ужас людского множества»,—как я позволил себе однажды написать о нем) немало обязано тринадцатиголосному эпизоду во Второй. А цитаты из «революционных песен» в Одиннадцатой и Двенадцатой симфониях разве не были перекличкой с программным содержанием «Посвящения Октябрю» (не забудем о названии Второй симфонии)? Другое дело, что здесь, во Второй, фольклорный материал проходит лишь тенью и что в целом эта симфония решительным образом очищена от идеологии большевистского государства, а также и от идеологии классической музыки. Но можно было бы сказать, не боясь никаких парадоксов, что сама партитура молодого Шостаковича является воплощенной революцией—как в обновлении языка, так и в мощи созидательного порыва.